The all new Turnigy 15A is an advanced switching DC-DC regulator which will supply a constant 8A or more with short bursts of up to 15amps! 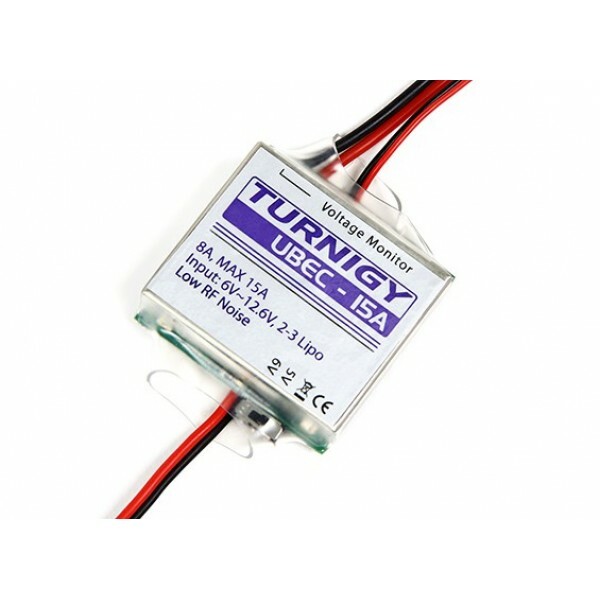 The Turnigy UBEC plugs into a 2 or 3 Cell Lipo pack and supplies a constant 5 or 6v to your receiver. Voltage monitoring features Voltage status indicator lights on the pack show whether your 2 or 3 cell pack is full, half charged or low. An excellent safety feature! Also included is an Output filter to reduce noise, an on/off switch and a step down regulator adapter. Comes with full setup instruction. The term UBEC is reffering to Universal Battery Eliminator Circuit. It is used by connecting the input wires to the main battery pack and the output to the receiver. This allows your Speed Controller to run cooler, and safer as you now have an external circuit to power your receiver and servos. Should the Speed Controller be overloaded and fail, you still have control of your plane or car. This small motor from Emax is ideal for models from 800-3000 grams (28–6.6lbs). This is motor.. Suitable for .25 -.32 ( 30E ) size modelsDualsky Eco Motor 2826C 850KVDualsky ECO series brushless o..
Glow equivalent of .32-.40 2 stroke and .50 4 strokeECO V2 has made great improvements in many resp..
Glow equivalent of .46-.55 2 stroke and .65-.70 4 strokeECO V2 has made great improvements in many .. Equivalent of 30cc to 35cc gas motorsGA motor - For giant RC airplane seriesHigh torque design, diam..
Motor Shaft for EMax BL2826 Series Motor (5mm x 66.5mm)..